The SMILE Cafe has been primarily set up top address the needs of Carers, those they care for and their families - to gain a little respite and to sit down with others, with similar issues, and share experiences and information. From time to time there will be visiting professionals and support agencies will be on hand to provide more information, advice and guidance. 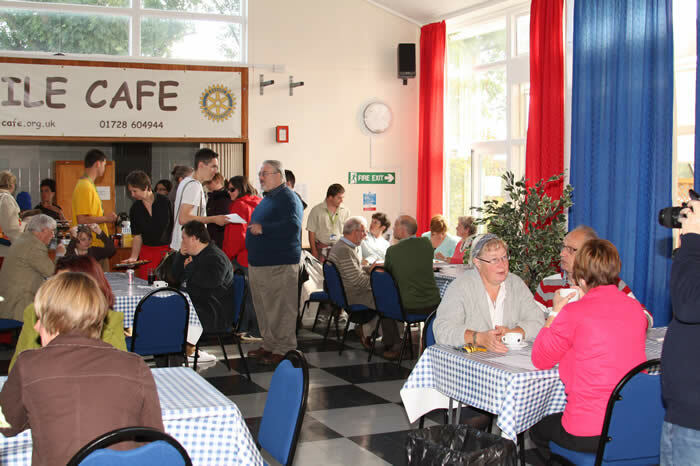 However, the SMILE cafe is all about reducing social isolation and is a welcoming place for all those seeking some friendly company. Those living alone, over 50 and / or retired are particularly welcome too. Among the variety of customer groups that the SMILE Cafe aims to support are those diagnosed with dementia. At present there are 9,000 people in Suffolk diagnosed with dementia and, by 2030, that figure is expected to double. The SMILE Cafe will develop elements of a "memory cafe" and provide a place where people with dementia, and their carers, can visit to support each other, share information and enjoy reminiscence-based activities. Health and social care professionals will be invited to give short talks and answer questions, in an informal setting. The expectation is that SMILE Cafe visitors will make local friendships and support each other outside of the SMILE Café setting. The SMILE Cafés does not provide a formal care service and there is no formal assessment or referral process and no pre-booking is necessary. The informal SMILE Cafe setting aims to reduce the isolation often felt by people with dementia, and their carers and families, and offers the chance to just chat informally. However, the SMILE Cafe is not suitable for people with dementia to attend alone if they have specific care needs such as problems with continence, mobility issues that require aid, high levels of anxiety, challenging behaviour or medical conditions that require monitoring. The SMILE Cafe is not a ‘drop off’ facility for short periods of respite.